A new global growth agenda to counteract secular stagnation and dispersion is possible. This strategy must primarily be a structural one that rebalances the growth model that has guided the international community for a generation by fostering a renewed appreciation of the crucial role that a wide ecosystem of both demand- and supply-side structural policies and institutions plays in diffusing opportunity, income, security, and quality of life while strengthening the resilience and even rate of growth. This more systemic approach to combating inequality requires not only a new growth and development strategy but also a broader set of metrics that capture the bottom-line objective of national economic policy: sustained, broad-based progress in living standards. Three complementary sets of metrics – Policy and Institutional Indicators illustrating relative institutional strength and policy effort; National Key Performance Indicators; and an Inclusive Development Index providing an alternative ranking of countries’ levels of development and recent progress – have been developed for this purpose as part of this Report. All of this data has been compiled in individual Country Profiles, which are available online. This new growth and development agenda requires a commitment to action at the national and international levels. Governments should use this new framework and metrics to develop national programs to address identified weaknesses with the support of international organizations and other stakeholders, particularly with respect to expanded investment in workforce productivity, compensation, and security. The international community should buttress these national efforts by funding a major increase in institution-building assistance for developing countries in the corresponding policy domains. It should also reform development finance institutions to support a scaling of blended, public-private financing of sustainable infrastructure to promote worldwide implementation of the Paris Agreement and progress toward the SDGs. And the international community should reset the priorities of trade and investment cooperation to facilitate commerce and investment in several new respects that would boost global economic growth and social equity. A coordinated global initiative along these lines is what is required to transform inclusive growth from aspiration into action – into an agenda that places people and living standards at the center of national economic policy and international economic integration. Such an effort to reshape the assumptions and priorities of the way modern market economies organize themselves to generate socioeconomic progress can only be realized with the engagement of all stakeholders. This calls for a collective commitment to greater responsiveness and responsibility in economic leadership by government and business leaders. The World Economic Forum’s System Initiative on Economic Growth and Social Inclusion provides a platform for such multistakeholder commitment and engagement. Recognizing the high degree of interest around the world in innovative, evidence-based solutions that are replicable in different contexts, the Initiative works with its partners to distill and disseminate positive examples of public policy and business practice that promote inclusive growth. It then enables their application in specific countries and regions by leveraging the Forum’s platform to stimulate direct cooperation for this purpose among governments, international organizations, companies, civil society, and experts. The Initiative’s role as an enabling platform to facilitate direct cooperation (i.e., action) on inclusive growth and development by multiple relevant stakeholders, including other international organizations, is reflected in the design and recommendations of this Report. Important policy contributions have been provided by the IMF, OECD, ILO, World Bank, WTO, Finance Ministry of Canada, and McKinsey Global Institute. Valuable lessons in the practice of inclusive growth at the corporate level have been contributed by Microsoft and Barclays. The Report’s central recommendation is that countries eager to improve social inclusion and economic growth should assemble a much wider structural economic reform strategy than has been the norm, drawing from the considerable expertise available within the international community, particularly in the OECD, ILO, World Bank, and other international organizations specializing in these areas. This practical, action-oriented platform approach is reflected as well in the Initiative’s work program, which has three interrelated dimensions: developing new policy frameworks and metrics (of which this Report is a principal manifestation); identifying and disseminating best practice in terms of both public policy and corporate practice; and facilitating multistakeholder engagement in the development of national and regional strategies by governments on the one hand, and of corporate strategies by firms on the other. The Initiative’s multistakeholder platform is available to facilitate policy support and stakeholder engagement. All of this activity helps to shape the World Economic Forum’s meetings and communities around the world, including its Annual Meetings, Regional Summits, and National Strategy Meetings. It will inform as well the development of the Forum’s new Center on the Fourth Industrial Revolution in San Francisco, California, which will examine governance considerations related to emerging technologies, including cross-cutting societal issues such as those addressed by this Report. Through this System Initiative, the Forum seeks to contribute to a better appreciation within societies of how to make inclusive growth and development a reality at a time of accelerating change. An open global economy has been critical in reducing poverty and raising income around the globe, thanks to its key distinguishing feature: the flow of know-how from high-income to lower-income countries. Global Value Chain (GVC) integration brings growth and development, and GVCs can be a powerful engine for economic and social advancement, as evident from the substantial upward income mobility in China and other economies that have embraced GVC-led growth strategies. Financing: Markets in general provide less financing for SMEs and new entrepreneurs than socially desirable, particularly in emerging markets. Hence, innovative and transnational financial instruments are necessary, as is financing that takes into account the local know-how, pool of talent, distribution channels, business relationships, business models, and access to technology in the assessment of repayment ability. Investment in people: Education and skills training, active labor-market policies, and social safety nets are key ingredients in an effective package of policies that must complement liberalization. Improving the policy environment: This is imperative to encourage investment, public and private measures to upgrade supply-side capabilities, and increase businesses’ ability to exploit new market opportunities. While the needs are clear, concrete policy and business responses are not. To address some such information and coordination failures, the World Bank Group and the World Economic Forum are collaborating on a “New Vision for Development” aimed at advancing public-private collaboration to ensure that firms engaging in global markets can help create more sustainable value chains. By developing a user-friendly virtual platform and incubating a community of champions seeking to advance a more inclusive model of international production, this initiative aims to share and facilitate the adoption of innovative, evidence-based solutions, and connect public and private actors. The aim is to ensure that firms’ engagement in global markets – for goods, services, investment, and ideas – generates more inclusive economic growth and more social impact around the world. A new industrial revolution is under way. The world has entered an era of rapid transformation with amazing potential to not only serve business but also help address the most pressing issues of the day.11-1 At the heart of this revolution is cloud computing, where innovations are enabling the collection, storage, and analysis of data at breathtaking speed and scale. Such breakthroughs will surely help serve humankind, though society must remain conscious of technology’s disruptive potential. One question that must be asked is: How can society ensure that the benefits of the cloud are universally accessible and equitably shared? For this purpose, Microsoft is taking comprehensive action in partnership with governments, non-profits, and other organizations. One example is in the area of affordable Internet access, where there is great disparity between developed and developing countries.11-3 To help bridge this divide, the company is utilizing TV white spaces, the unused or underutilized spectrum frequencies, to support more than 20 affordable Internet-access projects in over 15 countries by the end of 2017. In ongoing projects, Microsoft is seeing positive impact including improved educational results, creation of new businesses and jobs, and growth in the number of connected communities. It is also important to ensure that people everywhere have access to educational opportunities that provide the skills and knowledge needed to thrive in a digital economy. Microsoft Philanthropies is working with non-profits, schools, governments, and other businesses to improve the digital skills of people of all ages, and to make computer science education accessible to more young people around the world. In 2015, Microsoft made a three-year commitment of US$75 million to fund computer-science education programs globally. These programs have reached millions of youth in 60 countries, providing computational thinking and problem-solving skills that can be applied in any career, a greater ability to innovate, and the opportunity to pursue sought-after computer-science jobs. Bringing the power of cloud computing to the non-profit organizations that are empowering others and addressing vital societal issues is a critical investment for the future. In 2016, Microsoft launched an initiative to donate US$1 billion of cloud services to support 70,000 non-profits worldwide over three years. It has already reached more than half this number, enabling a broad array of non-profits to achieve their missions with increased insight, efficiency, and impact. While these examples indicate significant steps forward in making the cloud more inclusive, the challenges and solutions are bigger than any one company can attempt. All stakeholders must work together to realize a technology revolution for all. This Report highlights the public policy framework needed to promote inclusive economic growth, but the private sector also has a key role to play. Since 2012, Barclays’ Social Innovation Facility (SIF) has been fostering an environment conducive to social innovation across business lines and geographies with the aim of facilitating inclusive, shared growth for all. SIF incubates products throughout the development period, right from market scoping to commercialization. This enables Barclays to overcome common challenges to successful social innovation such as short-term planning horizons, limited risk appetite, and competing priorities and resources. The facility identifies and pilots innovative approaches by discovering talent across business lines. It also works with internal product development teams as well as external start-up technologies through Rise, Barclays’ open-innovation platform.12-1 To date, SIF has funded over 40 projects with an average financial commitment of around £600,000. These projects include financing of agricultural supply chains in Africa and conducting research on investor motivations for impact investing using Behavioral Finance expertise.12-2 The insights from this work have informed the development and launch of Barclays’ impact-investing proposition. This offering will enable clients to make investments that generate social and environmental impact in addition to financial returns by choosing select investment products and services. SIF will also incubate the Barclays Women in Leadership Index, which features companies with a female CEO or with more than 25% female representation on corporate boards, with the aim of building awareness of the importance of gender parity in corporate leadership and bolstering relationships with institutional investors (see Chart 1 for a performance overview). In 2016, the Bank of Montreal launched a new mutual fund that tracks the Barclays North American WIL. Most recently, in October 2016, Barclays’ SIF funded the launch of an “Impact Series” from the Barclays research team, designed to explore the impact of economic, demographic, and disruptive changes on markets, sectors, and society at large. The inaugural report, Sustainable Investing and Bond Returns,12-3 explores the relationship between environmental, social, and governance (ESG) investing and bond portfolio performance. The research shows that a high-ESG portfolio outperforms a low-ESG portfolio over a seven-year horizon, with the governance score leading to the strongest impact on performance and credit quality. of the Competitiveness Lab” (World Economic Forum, September 2016), https://www.weforum.org/whitepapers/bridging-skills-and-innovation-gaps-in-latin-america-country-implementation-of-the-competitiveness-lab. 68 World Economic Forum and Bruegel (forthcoming). 69 World Economic Forum, White Paper on Future Preparedness (forthcoming). Africa’s Competitiveness” (World Economic Forum, May 2016), https://www.weforum.org/reports/an-action-agenda-for-africa-s-competitiveness; “Travel and Tourism Competitiveness Report” (World Economic Forum, May 2015), https://www.weforum.org/reports/travel-and-tourism-competitiveness-report-2015. 10-1 Richard Baldwin, “Trade and Industrialization after Globalization’s Second Unbundling: How Building and Joining a Supply Chain are Different and Why it Matters,” NBER Working Paper 17716 (2011). 10-2 Daria Taglioni and Deborah Winkler, Making Global Value Chains Work for Development (Washington D.C.: World Bank, 2016). 10-3 Cali Massimiliano and Claire Hollweg, “The Labor Content of Exports in South Africa: A Preliminary Exploration” (Washington D.C.: World Bank, 2015). 10-5 Thomas Farole and Deborah Winkler, “The Role of Mediating Factors for FDI Spillovers in Developing Countries: Evidence from a Global Dataset,” in Making Foreign Direct Investment Work for Sub-Saharan Africa: Local Spillovers and Competitiveness in Global Value Chains, eds. T. Farole and D. Winkler: 56-86 (Washington, D.C.: World Bank, 2014). 10-6 Cusolito Ana Paula, Raed Safadi, and Daria Taglioni, Inclusive Global Value Chains: Policy Options for Small and Medium Enterprises and Low Income Countries (Washington D.C.: World Bank Group and Organization for Economic Cooperation and Development, 2016). 11-1 See, for example, “Deep Shift – Technology Tipping Points and Societal Impact,” World Economic Forum Global Agenda Council on the Future of Software & Society Survey Report (September 2015), http://www3.weforum.org/docs/WEF_GAC15_Technological_Tipping_Points_report_2015.pdf. 11-2 “A Cloud for Global Good – A Policy Roadmap for a Trusted, Responsible and Inclusive Cloud,” Microsoft (2016), http://www.microsoft.com/cloudforgood. 12-1 Barclays’ open-innovation platform, https://thinkrise.com/. 12-2 Barclays Wealth and Investment Management, “The Value of Being Human: A Behavioural Framework for Impact Investing and Philanthropy” (September 2015), https://wealth.barclays.com/content/dam/bwpublic/global/documents/wealth_management/wp-a-behavioural-framework-for-impact-investing-and-philanthropy.pdf. 12-3 Barclays Investment Bank, “Sustainable Investing and Bond Returns” (October 2016), https://www.investmentbank.barclays.com/our-insights/esg-sustainable-investing-and-bond-returns.html. 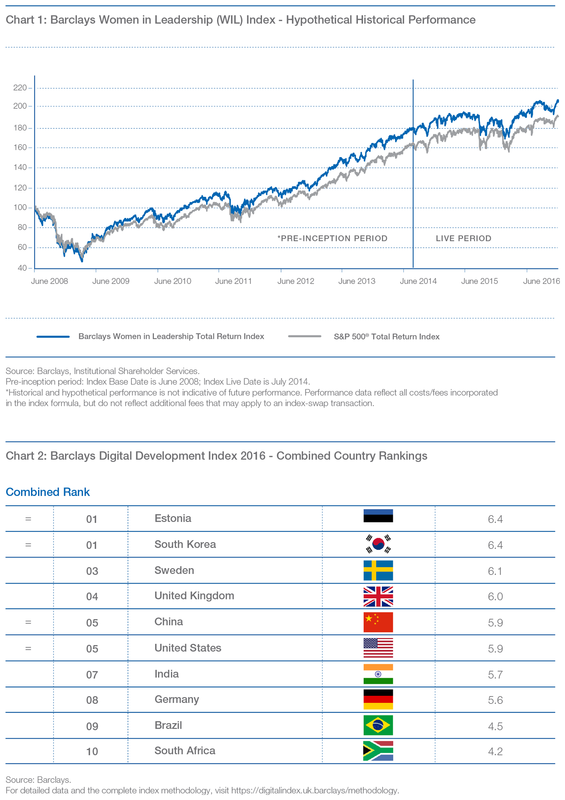 12-4 Barclays Bank Plc., “From Inclusion to Empowerment: The Barclays Digital Development Index” (July 2016), https://digitalindex.barclays/.